Bonni-Lynne Sandler, of South Hadley, talks about her life during her class at HeartnSoul Yoga & Wellness. Elizabeth Nett, of Northampton, talks about her life during a class at HeartnSoul Yoga Wellness. 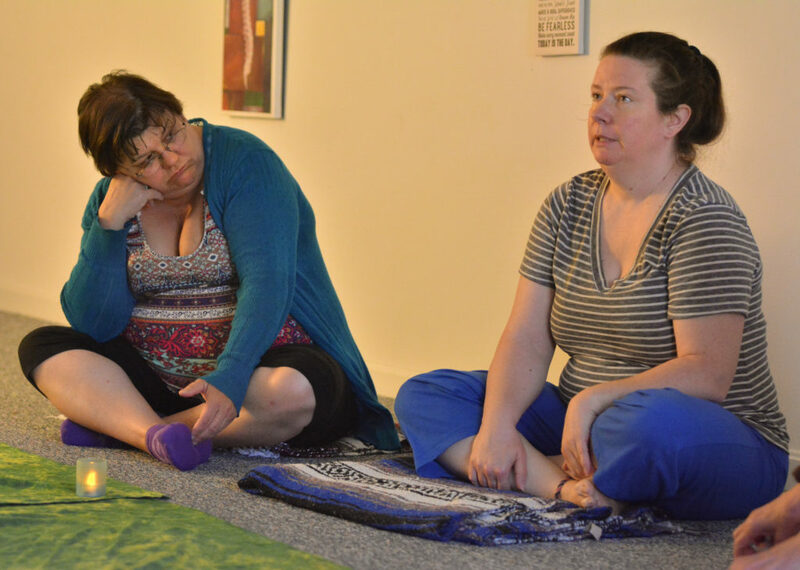 Bekki Strader, right, of Easthampton talks about her life as Jackie Daley, of Woronoco, listens Tuesday at HeartnSoul Yoga and Wellness. 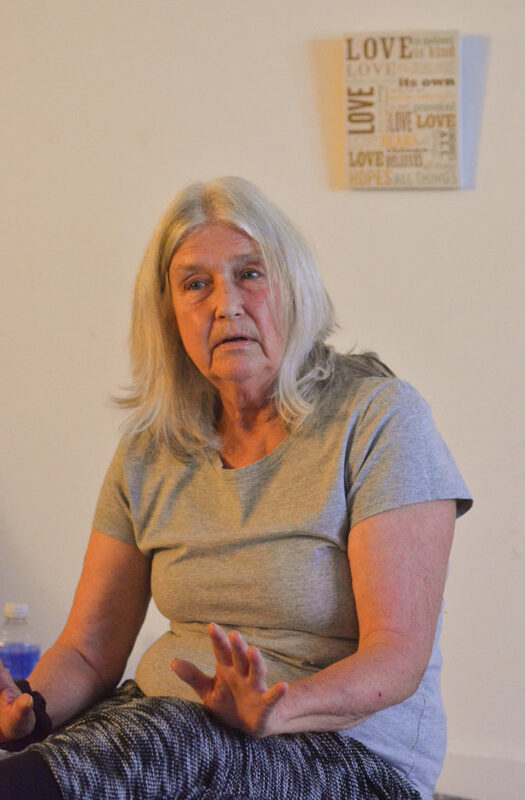 Jackie Daley, of Woronoco, talks about her life Tuesday at HeartnSoul Yoga & Wellness. 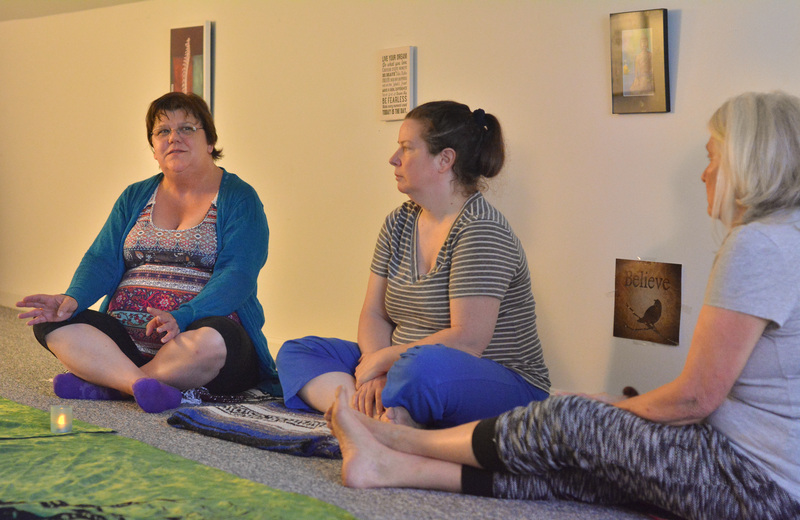 Jackie Daley, left, of Woronoco, talks about her life as Bekki Strader, center, of Easthampton, and Elizabeth Nett, of Northampton, listen, Tuesday at HeartnSoul Yoga & Wellness. 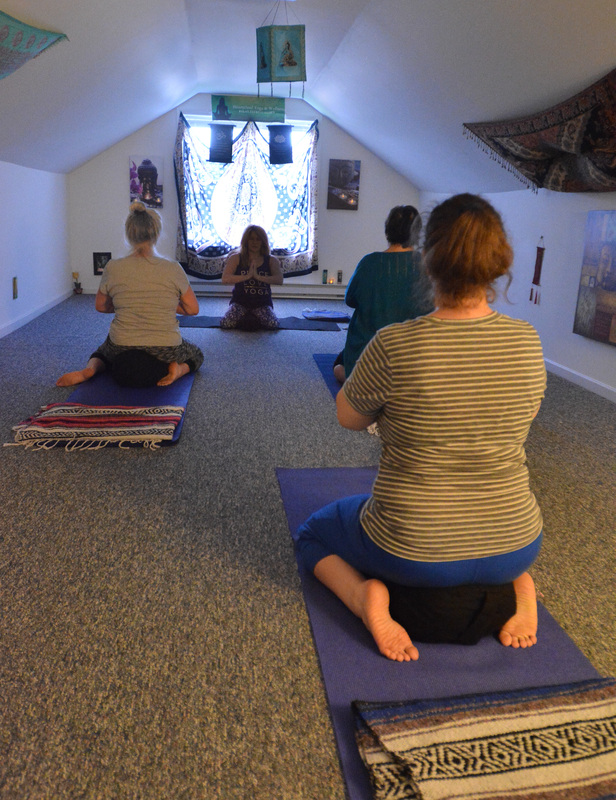 Bonni-Lynne Sandler, center, leads her yoga class Tuesday at HeartnSoul Yoga & Wellness. While I was growing up, my dad was addicted to alcohol and crack cocaine. He still is, he’d say, although he’s been sober for more than six years. At times it wasn’t easy having a good relationship with my dad, but the thing that always got us through rough patches is that we’re both talkers — no subject was ever off-limits. There’s a certain release that comes with saying things out loud in front of other people who understand what you mean. Yoga is like the body’s version of this process. Just as verbal expression carries with it a cathartic sense of easing mental sticking points, yoga is like a hearing aid that allows you to hear where your body is screaming for help, acknowledge the screams, and then let them go. That’s why recovery yoga, a combination of addiction recovery and yoga, is a stroke of genius. Locally, there are at least two women — Bonni-Lynne Sandler and Elizabeth Nett — who are bringing the movement to Western Mass. Founded in 2012 as Yoga of 12 Step Recovery, or Y12SR, the program certifies yoga instructors in how to administer 12 Step Recovery Classes. It’s a program of Off the Mat, Into the World, a California-based nonprofit seeking to provide affordable, holistic addiction treatment. Nett, who is a Y12SR certified instructor, struggled with alcohol before she got sober more than 25 years ago, while Sandler got involved with recovery yoga after helping her daughter overcome heroin addiction. Sandler, who opened HeartnSoul Yoga & Wellness this April, says at first she didn’t want to tell anyone that her daughter was a recovering heroin addict, but then she realized how many people, like her, were suffering in silence. Yoga, says Sandler, allowed her to work through her own role in her daughter’s addiction. The movement and release the practice offers, she says, helped her to realize that by allowing her daughter to live at home, without paying any bills, she was propelling her daughter down the path of addiction. That’s not an easy thing to do, she says, so it’s not surprising that the bulk of the class on one Tuesday is made up of the loved ones of addicts. 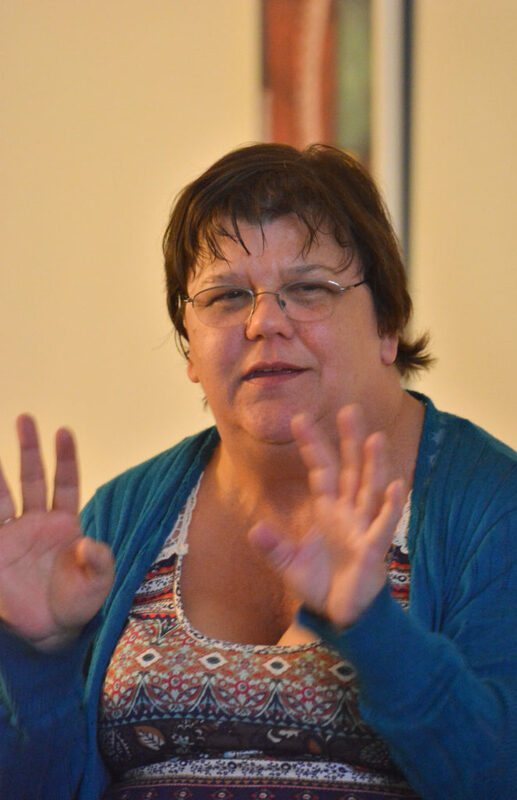 Sandler directs the HeartnSoul class on Tuesdays from 5:45 to 7 p.m. at 45 Main St. in Florence. On the night I attend, she asks us to sit in a circle on the floor. The lights are dim. A candle and a box of tissues sit in the center of the circle we create. The circle opens with the Serenity Prayer, (“God, grant me the serenity to accept the things I cannot change, the courage to change the things I can, and the wisdom to know the difference.”) and then we take turns talking about how addiction has affected our lives. Each person gets a maximum of seven minutes. While one talks, the rest are silent. 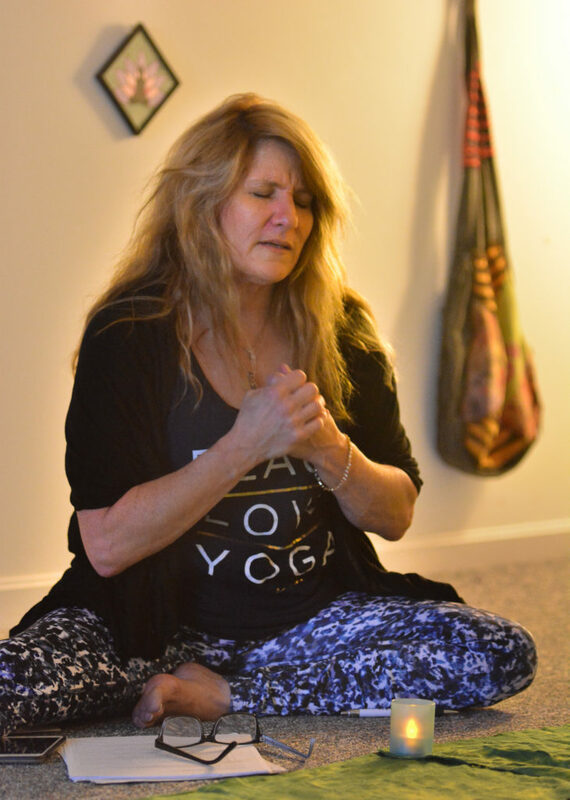 “In your heart,” says Nett, “to whatever you call God you can pray for them.” Nett teaches a by-donation recovery yoga class of her own on Tuesdays from 6:30 to 7:30 p.m. at 221 Pine St. in Florence. Sandler talked about the guilt she feels for not having seen her addiction sooner. Jackie Daley of Russell talks about being married to an alcoholic for 20 years and losing their house. She also talks about losing two close friends, who succumbed to their addictions. Then, as we move through several asanas, Sandler sprinkles wisdom throughout the room. We move into tree pose, and the moment lends itself to a perfect life metaphor as we struggle to stay upright in balance. Sandler says recovery is a natural progression, as we carry tensions — be they the cause of addiction or the symptom — in our bodies. Though the others in the room did not feel comfortable having their stories on the record, they spoke about the practice after class. Bekki Strader of Easthampton, who had never done yoga before she started Recovery Yoga with Sandler in February, says for her it’s about getting out of the house and talking and moving with people who understand. She says that while she’s busily picking up the broken pieces addiction has left behind, the practice is one positive thing that she can look forward to. “I have to do something for me,” she says. Contact Amanda Drane at adrane@gazettenet.com.